The chill in the air is one of the first signs each year that we are quickly hurtling toward the holiday season. Here are some unique and delicious holiday gift ideas for all of the tea lovers on your gift list. For those who want to give something that will satisfy the tea lover in your life, have we got a simple gift choice for you! We’re proud to offer our original blend and flavored teas in a beautiful wood tea chest. You can fully customize your chest by filling each of the 8 compartments with peach, peach with stevia, raspberry, and raspberry with stevia or green herbal tea. Or you may also choose the 100 counts original blend with sage or chaparral tea to fill the chest. And if you just want the box for your own gift, we offer that too! 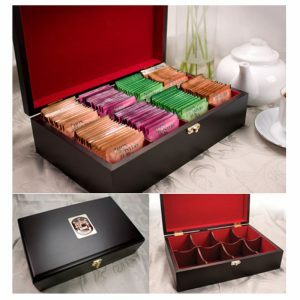 Right now for the holiday season all of our tea chests are significantly discounted. Check out the specials at the link above. Many a many a tea lover will have a collection of different teapots. There are so many different varieties available on the market today. Teapots are meant to be used and enjoyed just like the tea that they are used to brew. One of the most versatile and popular teapots is a type of ceramic teapot which is resistant to heat. This form is based off those which were created by artisans during the Ming Dynasty in China. These pots are often referred to as “The Father of Tea.” This design has largely continued to influence almost every other type of teapot design that we see today. 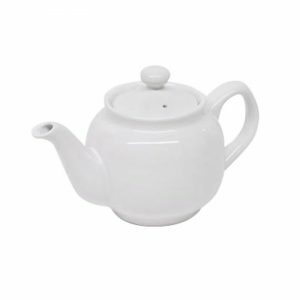 Our two-cup Hampton classically styled ceramic teapot is perfect for everyday use while our Savoy stainless steel teapot is versatile and functional with an attached lid and heat-absorbing handle. Nearly everyone has a favorite cup or mug they like to sip their tea from. Like teapots, there is a seemingly endless array of teacups or mugs available on the market. Some tea drinkers prefer a delicate, antique Chinoiserie teacup and saucer or a treasured bone china set that they grew up looking at in their grandmother’s china cabinet. Still, other tea enthusiasts love to enjoy their tea drinking from a mug made of hand-thrown pottery or one with a favorite slogan that they can warm their hands with on a cold winter day. By keeping the gift recipient’s likes and personality in mind, you can find something truly special that will suit them perfectly. Tea Balls – Whether you are brewing a cup of tea or an entire pot, a tea ball is one of the preferred ways to steep loose leaf tea. We offer a 2-cup mesh tea ball which is perfect to use with a favorite teapot or our stainless steel egg-shaped tea ball with drip bowl which works equally well when brewing tea in a teapot or in a jar for sun tea during the summer months. Tea Sacks – Tea sacks are a great way for tea connoisseurs to fill their own tea bags and choose just how much tea is right for them. Sir Jason Winters International offers fully biodegradable 1-00 count tea filter bags in sizes ranging from single cup size all the way to 3 -8 cup tea sacks. Reasonably priced, why not include one of each for your tea lover? Tea infusers – Similar to tea balls, a tea infuser is used to hold tea or herbs so that they can be steeped for the proper amount of brewing time. Simply place on the mug or teapot and add the desired amount of tea into the infuser. Submerge the infuser into the hot water and infuse to the desired strength. Once finished, the herbs can easily be added to the compost bin. Teabag Squeezer – Shaped like a pair of tongs, a tea bag squeezer is a handy little device to have on hand. It allows tea drinkers to safely pull tea bags from the cup or pot of tea. It also makes it possible for a true tea lover to get every last delicious drop of tea from their tea bag! Lemon Press – These fun little gadgets are real conversation starters that few can resist. Lemon presses can be functional with no frills, but there are vintage presses that are crafted in the shape of birds or animals. Simply put in a lemon wedge and press it into your tea. Books about Tea –There are few things in the world better than curling up with a cup of tea and a good book. There are scores of which focus on the topic of tea. There are books on the history of tea, ways to use tea in cooking, body care and jobs around the house as well. 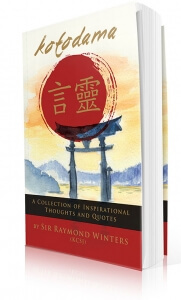 Here at Sir Jason Winters we even offer a number of excellent tea-related books including the story of Sir Jason Winters “What If: Reflection of my Father’s Life” by Winters as told by his son, Sir Raymond Winters, or books by Sir Jason Winters himself such as “The Perfect Cleanse”, “The Sir Jason Winters Story: Killing Cancer”, “Breakthrough”, and “Kotodama: A Collection of Inspirational Thoughts and Quotes”. Of course, the most important thing to give to any tea lover this holiday season is the gift of tea itself! Here at Sir Jason Winters International, we have a number of delicious tea varieties. We offer our Classic Blend with either sage or chaparral. Both of these flavors are also available in 20 count tea bags for the convenience of those who are on the go. Additionally, Sir Jason Winters also offers 20 count tea bags in green tea as well as raspberry peach flavored teas. Whether your gift recipient prefers loose tea, pre-brewed tea or tea bags, they can be assured of the gift of good health this holiday season with a gift from Sir Jason Winter’s teas. 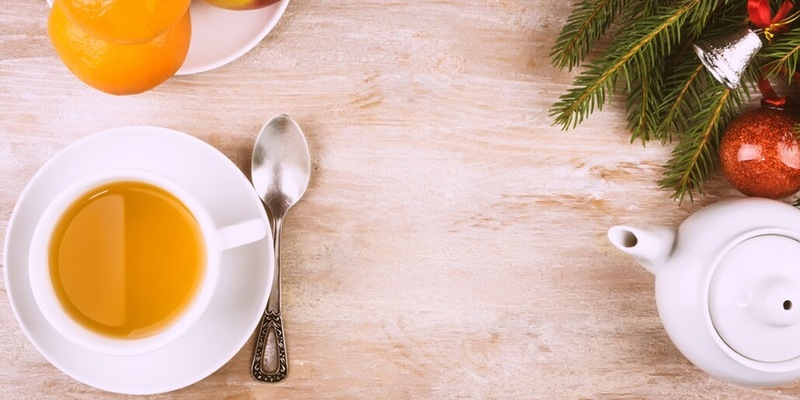 We hope that this list gives you some great ideas for things to give during the next holiday season for the tea lovers in your life!